The sun was boiling over the battlefield in Raymond as Private Howard Stevens set about the grim task of burying his brother, Captain Victor Stevens. He looked around the battlefield for some pine wood to build a casket but none could be found. So, he laid him in a blanket and placed him in the ground. Next would come the gruesome letter that he would have to write home to relay the news of Victor's death. Howard and Victor Stevens, Co. H, 20th Illinois Infantry, had joined the Union Army in the early stages of the war. At the time, both men were in their 20s. As the war progressed, they found themselves among the mass of soldiers who landed with General U. S. Grant at Bruinsburg Landing on April 30th, 1863. Eleven days later, after marching deep into Mississippi countryside, the Union Army, commanded by General McPherson, arrived on the outskirts of Raymond. Heavy fighting occurred as men in blue and the men in gray fought to defend their positions across Fourteenmile Creek. During the heat of battle, as bullets fell like rain, Victor was killed while leading a charge. "Our boys were suffering so badly that they crouched down to the ground to avoid the flying missiles of death which filled the air," wrote Sergeant Ira Blanchard. "We were loading and firing as rapidly as possible on the knee, and 'twas in this position that our Captain Victor H. Stevens was shot in the head and instantly killed." In a letter to his Cousin Em, Howard described the death and burial of his brother on the Raymond Battlefield. The letter was written some three weeks later - after arriving in Vicksburg. "While camped in the field near Vicksburg - May 31, 1863 - Dear Cousin Em, It is with sad feelings that I inform you of Victor's death. He was shot through the head, killing him instantly while galantly leading his men on to the charge. He was killed at the battle of Pine Hills near Raymond, Miss. He died without a groan or struggle. I succeeded in getting everything he had, and shall send them home the first opportunity. The Old 20th Ill. Inf. and I have been in 6 hotly contested battles since the first of May, and I have been with them every time. The battle of Pine Hills was fought May 12. I could not get an opportunity of sending Victor's remains home or get even lumber enough to make a box to bury him in. So we wraped him in his blanket and laid him in his grave. I am well at the present time. Grant has been laying around Vicksburg for 12 days. Vicksburg will be ours in a few days. No more for this time. When we get into camp, I will write you all of the particulars in regard to Victor, marches, & fighting. So excuse my haste. Give my love to all and keep a share yourself. Howard"
After receiving the letter, Howard's uncle traveled from Illinois to recover Victor's body from the battlefield. The trip was unsuccessful, however, since he was not allowed through the Rebel lines. He returned to Illinois without the body. Frustrated and heartsick, Howard wrote another letter home. "July 21, 1863 - Vicksburg - Dear Uncle, I have been advised not to attempt to send his body home until cool weather. For now, he would be nothing but a perfect mess of corruption. And finally I think it would be best to let him rest where he is. I know it would be pleasant for his parents and relatives to have his remains sent home and buried where his grave could be visited by them. I know it seems hard to leave him buried in a traitorous land. But the blood of our fallen heroes will purify and place an indellible stamp of true patriotism upon this curssed soil and every hero that falls will be as a nail driven in a sure place rendering the Union one and inseperable forever here-after. Howard." Following the surrender of Vicksburg on July 4th, 1863, the 20th Illinois marched on to Georgia. Howard was a part of that army. But, on the personal side, his life had taken a surprising turn. On December 25, 1863, he married Matilda Marsh of Vicksburg. Love reigned supreme because the couple didn't let their political differences divide their marriage. With a promised to return, Howard left his bride in Vicksburg and marched on to fight with Generals Sherman and McPherson in Georgia. During the Battle of Bald Mountain, the 20th Illinois was for all purposes destroyed. Descendants of Howard Stevens say, "From all accounts, no one from the 20th Illinois survived the Battle of Bald Mountain. But, Howard did. Was he actually there? We don't know. All we know is that he survived and returned to Vicksburg to his wife." To this day, Victor's body remains on the Raymond Battlefield in an unmarked and unknown grave. Following the close of the war, Howard and Matilda finally purchased land near Rocky Springs, Mississippi, where they settled and raised five children. The country that he once referred to as "traitorous land and curssed soil" had eventually become home. 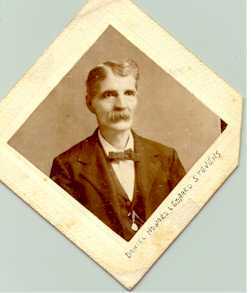 In 1905, Howard was buried in the Breeden Family Cemetery near Utica, Mississippi. The Steven brothers were finally laid to rest less than twenty miles apart.